Breitbart London: “Full Extent Of Skullduggery” By “Cabal Of Lying Climate Alarmists” Has Been Uncovered”! 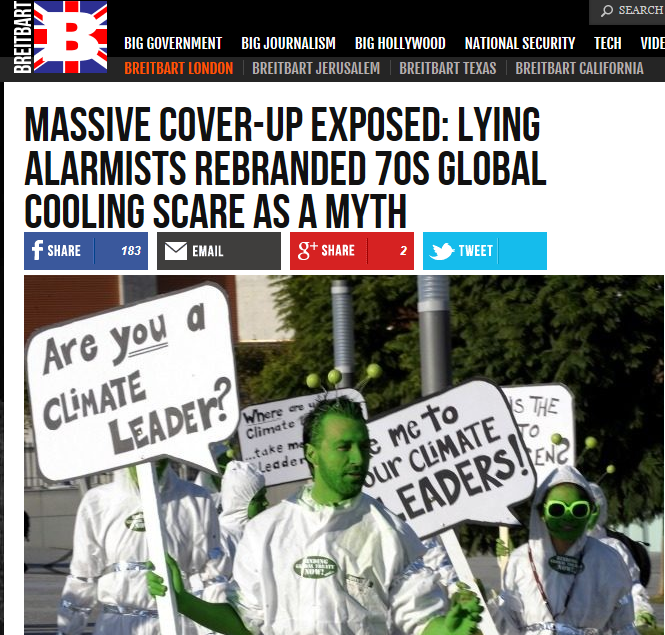 Browse: Home / 2016 / September / 14 / Breitbart London: “Full Extent Of Skullduggery” By “Cabal Of Lying Climate Alarmists” Has Been Uncovered”! Kenneth Richard’s post from yesterday on how a small group of alarmist scientists tried to whitewash away the global cooling scare of the 1970s has been making some waves. Not only was it made the top headline at Climate Depot, but also James Delingpole at Breitbart London here has written a scathing piece about the fraudulent, totalitarian tactics used by the climate alarmists to erase history and to rewrite it. Read the entire Breitbart London commentary here. Everyone knows that before the global warming scare began in the 1980s, scientists were much more worried about global cooling and the coming ice age. At least everybody did till a cabal of lying climate alarmists – one then a senior administrator at NOAA, now a president at the World Meteorological Association – hijacked Wikipedia, published a lying paper, and rewrote history by painting the 1970s Global Cooling Scare as an urban myth. These facts–concerning both the fraudulent alarmist disparagement of the “global cooling” alarmism of the 1970s, and the hijacking of Wikipedia by William Connelley–have been known in the blogosphere for years now. Tony Heller, a.k.a. “Steven Goddard” presented evidence of the “global cooling” scare time and time again, and I know, for example, that “pointman” has a post on Connelley featured on his “all time” list of best posts (sorry, I don’t have specific links to these two “skeptical warriors”; I’m sure you can find them easily with an internet search). Kudos to Kenneth Richard (and Pierre) for such an extensive documentation of the problem that Brietbart saw fit to include the story in it’s pages. Big news doesn’t report every pothole, but when you nuke the shining city on the hill, THAT’S news! Maybe this will force the powers that be to attempt to address it in an attempt to cover it up again, and in doing so they’ll get a little to close to the crater, and fall in. It is heart-warming to see that some truth is dribbling out. Maybe the Wikipedia owners will start correcting their attitude and policy to who gets to be administrator status on the Wikipedia. Until he acts Wikipedia’s pages on politics and climate is just more green propaganda. Effectively Wikipedia’s climate pages are just vanity publishing for William Connelley and his followers. When hell freezes over / when treasury bills are rejected. Oops sorry for he triplication. My PC comms has been up and down for a while, I was not sure any posts got through. wikipedia is the Ministry Of Truth. I go there to see what the regime wants me to think. Check up on the current rewrite of history. Wales is a regime stooge. Who finances him? In-Q-Tel, probably – the CIA’s “startup” financing arm. I like Delingpole’s stuff, I just wish he didn’t publish at Breitbart because I can’t in good conscience visit the site or share any content from there. After Andrew Breitbart died, the site has been taken over and turned into the organ of the American neo-Nazi and ultra-racist “AltRight”. The guy who runs it refused to send his kids to a school that had “too many Jews”. If Mr. Delingpole wants to associate with an outfit like that, he is certainly free to do so, it’s a shame, though, that his work will not get more notice because many refuse to give the owners of it the revenue bounce from directing page views there, to either the US site (Breitbart News) or the international spin-offs. Are you sure? I just did a site search on Breitbart for “Israel” and found dozens of articles, none appearing negative, while some appeared critical of those spurning Israel. If you’ve got something more concrete, I’d like to see it. Thanks in advance. Hey crosspatch. Why don’t you take a look at breitbart Jerusalem. Until falling out over trump, a jew called Ben Shapiro worked for them as well. Now I don’t read the Jerusalem edition, I only read Breitbart US and Breitbart London which also reports many things about Germany. So I don’t know what you’ll find there. But I think your reflective reaction is quite unfounded. And that reminds me. Breitbart constantly publishes articles by Pamela Geller. Geller’s a Jewish name. How does THAT rhymed with the racism you allege? And, you allege that alt-right is “neo-nazi” and “ultra-racist”. So are they? Hey let’s listen to what the alt-rightish Vox Day has to say shall we. Just like the whitewashing of history by progressives elitists, leftist public education unions, and textbooks publisher regrind the sordid history of the Democrat Party in the United States. See the movie, “Hillary’s America”.